Is there a way to force LaTeX to automatically change the formatting of the ?? that gets typeset in place of an undefined reference? For example, can one make LaTeX draw a yellow "highlight" background behind the ? ?, or render the ?? in red text? I would like it to be easier to spot these undefined references when skim reading PDF output. It would be especially great if this could be made to work for undefined bibliographic citations as well as undefined cross refs. Not the answer you're looking for? 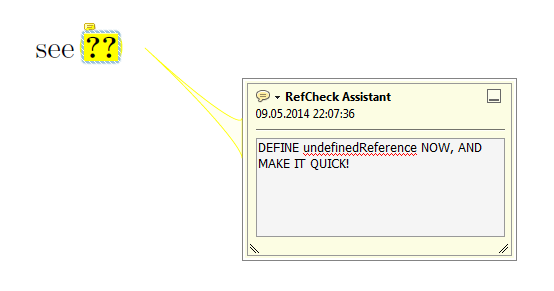 Browse other questions tagged errors cross-referencing highlighting or ask your own question. How can I automatically highlight SuperCollider symbols and environment variables? Text highlighting that works with CMYK xcolor mode? soul + highlight does not work with references?